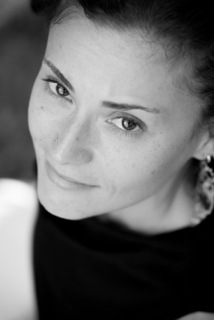 Andrea Scarpino received an MFA in Creative Writing from The Ohio State University, has been nominated for a Pushcart Prize, and published in numerous journals, including The Cincinnati Review, Connecticut Review, Los Angeles Review, PANK, and Prairie Schooner. She is the author of the chapbook The Grove Behind (Finishing Line Press, 2009) and a forthcoming collection from Red Hen Press, and is a weekly contributor for the blog Planet of the Blind. In addition Silk Road Review nominated her poem “Love as Stained Glass” for a 2012 Pushcart Prize. Elizabeth Vandermolen: You had two poems in the last issue of Silk Road that varied greatly from each other in both form and subject. How would you describe your writing style? Andrea Scarpino: I definitely tend toward the lyrical in all of my poetry, but I do like to maintain some sort of narrative thread, no matter how fine that thread may be. I also tend toward an involvement in place and the natural world, although that tendency isn’t really on display in the two poems Silk Road published. But I spend a lot of time thinking about how a particular place/scenery/landscape is altering my thinking and writing, my mood, how I understand my place in the world. EV: Who do you feel has influenced you as an artist? AS: There are so many people! I grew up reading Dickinson and Plath and loved both of their work for different reasons—attention to fragments and fragmented moments in Dickinson, and the ability to emotionally connect with a poem through Plath’s work. But I also love poets like Adrienne Rich and Carolyn Forche, Muriel Rukeyser and Maxine Kumin—poets who connect with the larger world around them in interesting and surprising ways. I also have been very influenced by visual art, by the paintings of Pablo Picasso and Frida Kahlo, by stained glass windows in churches, by sculpture and dance. And as I said earlier, by place. When I lived in Los Angeles, I found myself writing poems with fire and drought and desert landscapes. Now that I live in Michigan, I find myself writing poems with snow and water and lush landscapes. EV: I was very amused by your poem Overheard in Lincoln, Nebraska. My favorite line was, “As far as I can tell, the Russians/ aren’t making licorice.” How often do you find yourself inspired by conversations you overhear? AS: Honestly, I eavesdrop more than I probably should admit. Sometimes I find myself more engaged in listening to a complete stranger’s conversation than in paying attention to my own conversation—which again is not something I should admit! But I find the language we use in everyday conversations really interesting and evocative, particularly when we come upon another’s conversation in broken fragments, overheard as we’re doing something else entirely. EV: Writing a good love poem is a daunting task yet you captured the feeling beautifully in your poem Love as Stained Glass. The metaphor works so well in the body of the poem largely because the word “love” is only appears in the title. How important do you find titles in your work and in poetry in general? AS: Well first, thank you, especially since I really struggle with titles. They feel so final, like they could make or totally ruin a poem, which I know isn’t entirely true. But I find that any one poem may go through multiple title revisions before I actually hit on the one that sticks. And sometimes this tells me that a poem hasn’t yet really found what it wants to say—when I can’t figure out the title, it may be that the body of the poem isn’t really working yet either, which is helpful information for me to have. In terms of poetry in general, I really like a descriptive title, something that helps me to read the poem that follows it, that helps shape my understanding of what’s coming next. For that reason, untitled poems make me a little bit crazy—I feel like I’m walking into a blind date. AS: You know, I’m not sure if I’ve ever thought that! I have memories of speaking poems to my mother before I could write—she would type them on a typewriter for me. But I didn’t really think of myself as writing poems; I was more recording moments or feelings or images that I thought needed to be recorded. In high school, I had a wonderful poetry teacher—a rare thing for a high school student—but even then, I’m not sure I dared to imagine what it would mean to be a writer. Writing was just something I did, something I loved, something incredibly important to me. And I think that’s still the way I think about it. EV: Okay, final questions. What are you currently reading? Or, if you had to recommend a book to read before the end of the year what would it be? AS: Everyone should immediately read Terry Tempest Williams’ book When Women Were Birds. I just finished reading it, and it is utterly fantastic—lyrical and magical and just right-on all around. There are sections—the opening chapter for example—that take my breath away and make my heart sink into my chest at the same time. Really, it’s one of those rare books that feels like it has changed something deep inside me. And I love that.